The Exadata marketing story is unrelenting, and Oracle backed it with plenty of happy customers for analysts to query at Open World this year. The stories were compelling; I’ll mention a few below. In the analyst pitch, we were shown a couple of dozen logos – good for a still relatively new high-end, long sales cycle, longer still production ramp up, product. The numbers are not Teradata rates yet, but CEO Larry Ellison claims a $1.5B pipeline. Whether you believe it or don’t, he’s telling the world – and if he misses by much, Wall Street will spank the stock, so personally I doubt that he’s pushing too far past his real expectations. The big news, of course, was a refresh of the product itself, as Oracle gets deeper into the power of leveraging hardware and software design together. Ellison and Mark Hurd are visibly moving database and db machines to the center of the business (if cynics think that’s because Fusion isn’t shipping yet, let them.) They are backing it with sales force specialization: hardware reps get compensated now for Exadata sales, and database reps are no longer being compensated for SOA Suite sales – sharpening their focus. Specialists are brought in for security, data integration and BI opportunities – again, freeing database reps to concentrate their efforts. An aside: Oracle’s discussion of these topics with the analyst community reflects its understanding of the power of messaging to us specialists. By contrast, Microsoft rolled its long-awaited SQL Server PDW (parallel data warehouse) out a few weeks later at a user event, and mounted no analyst track whatsoever. Its absence from the field, and lack of funding for such activities, continues. A few Microsoft pros (and they’re very good) try valiantly to maintain the cadence, but there is too much to do. The enterprise business is not like the consumer and low-end business, and Microsoft’s marketing motion doesn’t reflect that. Oracle has its share of conflicts, disagreements and challenges with the analyst community – but it is, at least, engaged. Exadata is not a server. It’s a system, with a both a storage server – a smart one – and a compute server. Both have memory and processors that run part of the workload and optimize what they are designed for. This refactoring of the architecture is enabling Oracle to step into interesting new ways to optimize performance. Oracle’s new systems are third generation, so naturally they’re called X2. (Perhaps this is just revisionist history, removing the old HP product from the record.) 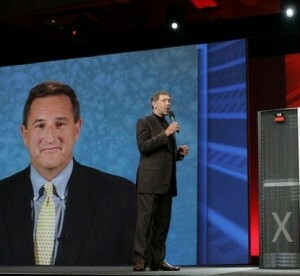 Exadata X2-2 (formerly known as V2) is a relatively modest update from its predecessor. It still comes in quarter rack to full 42-unit rack configurations. Details are easily had on the web site, so I won’t dwell on them here. Biggest weakness compared to MPP competitors – you can’t scale one blade at a time. It’s “closed.” Does this matter? The market will decide. The X2-8 is really new. It also has two database servers, each with 8 x eight-core Xeon X7560 processors and 1 TB of memory. It is available with either 600 GB or 2 TB SAS disks, has 5.3 TB of Flash Cache, and comes in full racks only – even less granular scaling than the x2-2. The racks can be connected together, via Infiniband – which promises huge speed-up opportunities, especially compared to MPP systems that connect over Ethernet, even 10 gig Ethernet. More happens in the storage server now. Oracle claims both WHERE and JOIN filtering, incremental backup filtering, storage indexing, db-level security, encrypted scans, and data mining model scoring, all at the storage level. Given that Andy Mendelsohn told us that 70% of Exadata customers so far are using Exadata for data warehousing, this is good stuff. And the fact that encryption and compression are happening at that layer only redoubles its power. All Oracle apps – and SAP – are now certified with Oracle encryption; one can expect Oracle to begin hitting this topic more aggressively in the months ahead. Another theme to expect is compression. Oracle has refined its hybrid columnar compression story and is rolling it out as a competitive theme against Teradata: Juan Loaiza said “Teradata is way behind on compression, claiming 30%. We claim 10x.” One of the customers (name NDA) told analysts attending that it got 10X compression for its data warehouse – from a starting point of 250 TB, bringing it down to 27TB. The customer asserted storage savings, faster backup and reorg and a 10x speed-up in query performance. And that, they claimed, was “average” – some were as high as 400x. These are the kind of numbers ADBMS specialists have been claiming in head-to-head POCs they have been winning against Oracle legacy systems. Oracle says it wants Exadata to play – until recently, it wasn’t their new baby in the mix, but the aging products already in the shop. Oracle means to change that, though some observers tell me they still see reluctance on Oracle’s part to bring Exadata in for POCs. George Lumpkin drilled in deeper to the analytics and data warehousing story for the assembled analysts. He highlighted database release 11.2.0.2 enhancements to data mining – “we can ingest SAS models – PMML models right into Oracle Data Mining.” Exadata now supports 7 PROCS from SAS: FREQ, MEANS, RANK, REPORT, SORT, SUMMARY, TABULATE. The relationship between the two firms is odd; there is little formal acknowledgment from the SAS side. I have not had the opportunity to dig in and try to understand this one. Oracle is now starting to take a leaf from IBM’s book with Exadata Intelligent Warehouse Solutions – data model, OLAP cubes, data mining, metadata, sample reports, prebuilt dashboards. Deloitte is a key partner- with a dedicated team for retail engagements. Oracle’s “Software. Hardware. Complete.” story still lacks a convincing owned Services play, and that will hold it back. Hurd may have a useful point of view about this as he settles in. The analyst day wrapped with a terrific panel of customers. Not surprisingly, their stories were positive. But some of the anecdotes were remarkable. One customer was literally unable to buy more power from its NY provider; Exadata saved it from untenable choices by saving so much on power it was able to provision an additional rack. Another told of how his “SQL ninja assassins” rejoiced when they were able to eliminate so many indexes and other artifacts, they improved load speeds 5-6x. Oracle has made it clear it does not plan to cede its position as specialty platforms ramp up. Today, it’s still tackling the specialization plays with a “single database works for everything” approach that is modified by form factor plays. Tomorrow? We’ll see. Larry always says he doesn’t believe in things he isn’t doing. Till he does them. Disclosures: Oracle is a client of IT Market Strategy.